For the 24 hours to 23:00 GMT, the AUD rose 0.41% against the USD and closed at 0.7137. LME Copper prices declined 0.5% or $29.0/MT to $6296.0/MT. Aluminium prices declined 0.8% or $17.0/MT to $2028.0/MT. In the Asian session, at GMT0300, the pair is trading at 0.7130, with the AUD trading 0.10% lower against the USD from yesterday’s close. The minutes of the Reserve Bank of Australia’s (RBA) October monetary policy meeting indicated that policymakers reiterated that the next move in interest rate is more likely to be upwards but central bank is in no rush for a near-term move in monetary policy. Furthermore, the officials noted that the global economic conditions proved positive for the economy, amid continuous trade upheaval. Elsewhere in China, Australia’s largest trading partner, the nation’s consumer price index (CPI) advanced 2.5% on a yearly basis in September, in line with market expectations. In the prior month, the CPI had recorded a gain of 2.3%. Moreover, China’s producer price index (PPI) rose 3.6% on an annual basis in September, at par with market consensus. In the previous month, the PPI had climbed 4.1%. 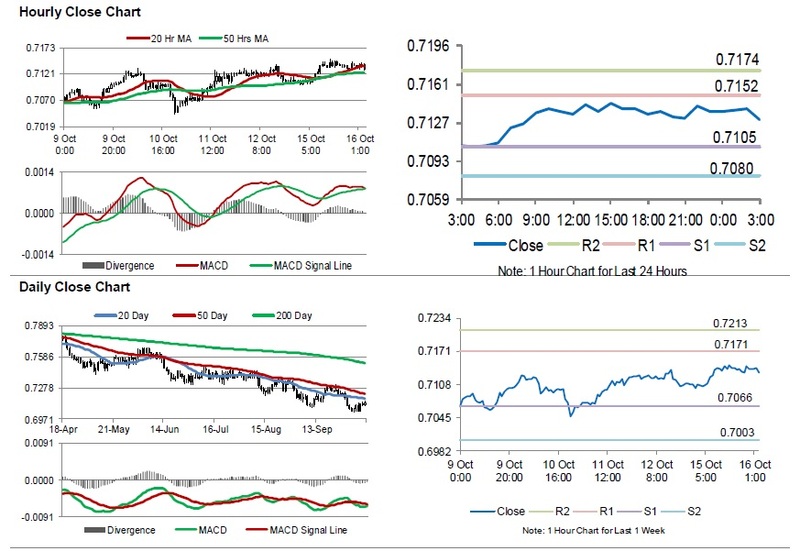 The pair is expected to find support at 0.7105, and a fall through could take it to the next support level of 0.7080. The pair is expected to find its first resistance at 0.7152, and a rise through could take it to the next resistance level of 0.7174. Trading trend in the Aussie today is expected to be determined by Australia’s Westpac leading index September, slated to release overnight.